Meal Fell summit with Great Sca Fell behind. 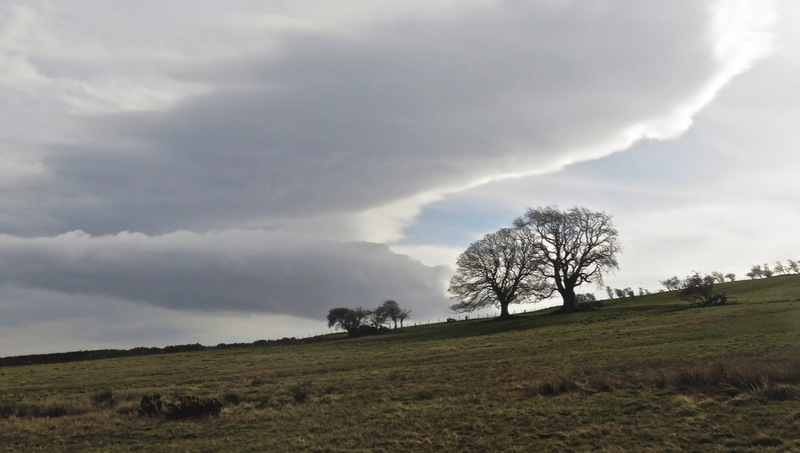 Weather conditions: Drizzle after 3pm, but until then, dry, bright and quite sunny at times. But was it warm? Definitely not, thanks to a ferocious wind, not just on the tops but in most of the valleys, too. A walk to rank up there with the breeziest. 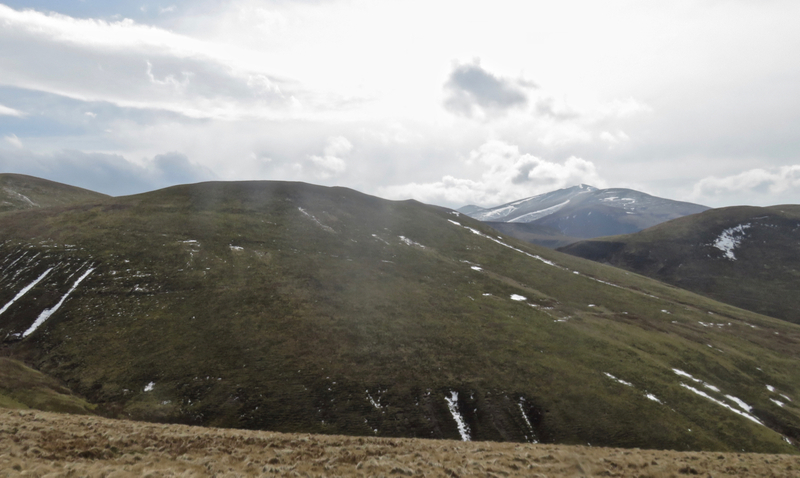 Summits bagged: St. John’s Hill (925 feet above sea level, number 140 of my second round) and Caemote Hill (945’, no 141) — the two summits in the Caermote Hill chapter — then Longlands Fell (1585’, no. 142), Meal Fell (1804’, no. 143), and Great Cockup (1726’, no. 144). The first two were previously bagged on walk 79 in February 2014, the other three on walk 26 in October 2010. Other fells gather around the route and could be added to the walk, most obviously Binsey, which I would have added had I not already bagged it twice. 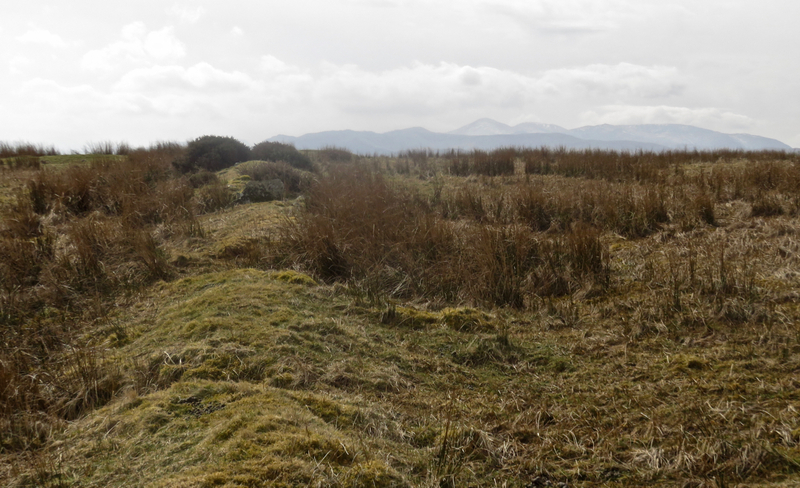 Great Sca Fell and Brae Fell are also addable with probably only minimal extra effort. Start and end points: As the title of the walk suggests, started in Bothel, and finished in Bassenthwaite. Bothel can be reached on either a #554 (Carlisle – Keswick) or #600 (Carlisle – Cockermouth) bus. Bass Village is not on the bus route, but Bass Chapel, a few minutes’ walk away, lies on both the #554 and the #X4 (Workington – Penrith) route. The walk fitted, with plenty of time to spare, between 10:20, when the 09:30 #554 service from Carlisle deposited me in Bothel, and the 16:57 #X4 service from Bass Chapel to Penrith. Distance walked: 12.75 miles approximately. Total ascent: 2500 feet approximately. Pub at end: Finally, a proper visit to the Sun Inn in Bassenthwaite. I had managed to walk past it on more than one previous occasion when it was closed, and then managed about 90 seconds in it on walk 59. Today I arrived there only three minutes after it opened (at 4pm on a Friday), and was the only customer for the next forty minutes, But it was worth the wait. Some classic 80s pop on the stereo, though I told the landlady that if Spandau Ballet’s True came on, I was leaving. Do remember to leave time to get to the bus stop out on the main road at Bass Chapel. Ten minutes should be ample. Route: This walk is fairly long, but the way is easy. Only the pull up to Longlands Fell feels tiresome and that could be made easier (but longer) by going round a different way. 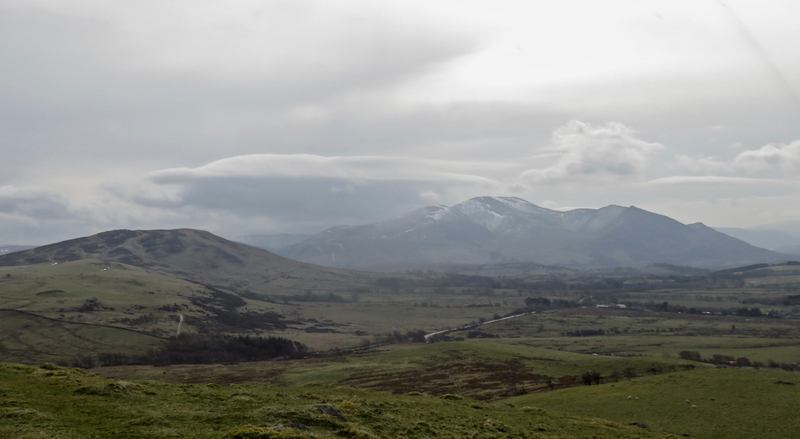 Except for from Caermote Hill, there are not many views of the Lakes — although Skiddaw looks magnificent throughout — but northward vistas are good. On the whole, paths are dry and fairly clear, but the early stages, on Caermote Hill, are irritatingly obstructed by fences, barbed wire and gates that do not open. Actually I was a bit perplexed by the start of the walk, not remembering this being a problem the first time I was here, on walk 79. On that walk the bus went through the village, but this time, it took the bypass, which has a bus stop on it next to a lane that looked very much like where I began that last walk. What must have once been a wall of the Roman fort at Caermote. This really is as much as you see of it. But it can’t have been the same lane, as this time, shortly after leaving the village I was lost in fields and having to negotiate worrying quantities of barbed wire to proceed, including one spike that jabbed itself in the ball of my thumb and left me nursing it and worrying about tetanus for the rest of the walk. Why is this necessary? Who can it be really deterring? This is not just because I lost the main route — once up on the ridge of St. John’s/Caermote Hill there were still barbed wire obstructions on a path that is clearly described in Wainwright’s pages. This was the most annoying thing about the walk, though fortunately it is only a factor in those first two miles. Once up on the ridge, bear right (south); look out for the summit earthwork of St John’s Hill over the wall (and behind another skein of barbed wire), remember it is a Wainwright, and carry on ahead to Caermote Hill and its stupendous view of Skiddaw and Bassenthwaite Lake, not to mention round to the coastal plain and Solway Firth. To descend just head down off the corner of the fell, in the direction of Binsey, an easy climb down. Once through the gate in the corner of the enclosure, head along the straight fence towards the road, bearing in mind that the low ‘causeways’ you pass a few minutes later are the parapets of the Caermote Roman fort, not that you would know this without being forewarned. Head through this out onto the road, turn right, then once past the small plantation, take the broad path on the left which heads over the shoulder of Binsey. This is a straightforward, though unexciting, 45 minutes or so. When the path reaches a gate marked ‘Private, No Access’, don’t panic, look at the map: the way makes a right-angled turn at this point and follows the wall round to the secluded hamlet of High Ireby. When tarmac is reached, turn right, and then right again to Ruthwaite. 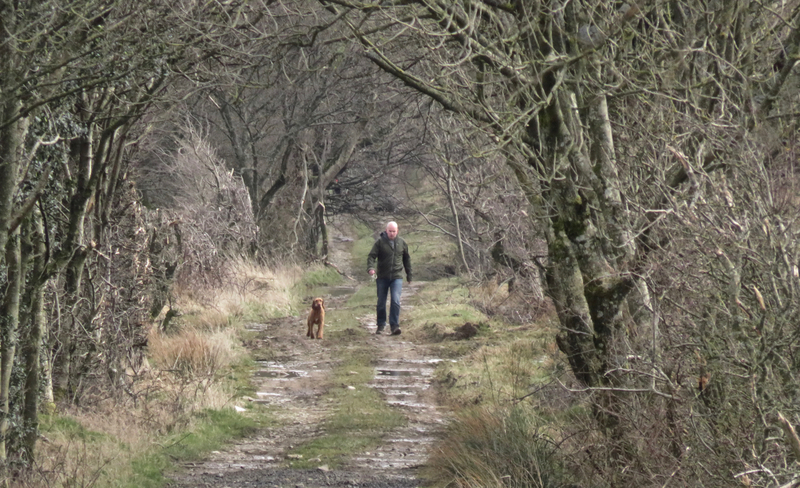 Right once more, then left at Marshall Cottage and follow a dead straight way for a mile or more, over the next cross-roads then down a rougher path (the picture of the guy and his dog was taken there). Turn right at the end, then next left down the drive of Chapel House Farm. Follow this lane over the dam of Chapelhouse Reservoir, and turn left once tarmac is reached once again, to reach Longlands hamlet, where go through the gate signed “Uldale Commons”. At this point, Longlands Fell is rising above. Wainwright suggests following the lane for a while then taking the ridge up to the summit. I looked up and saw, instead, what seemed to be a fairly clear path heading direct up the slope, which outside of summer (and the infestation of the dread bracken weed) looked practical enough, so I took it. It’s a bit of a haul though — the ridge is probably easier, although I must factor in the howling, in-my-face gale in which I had to make the ascent. Anyway, at least it leads direct to the summit. 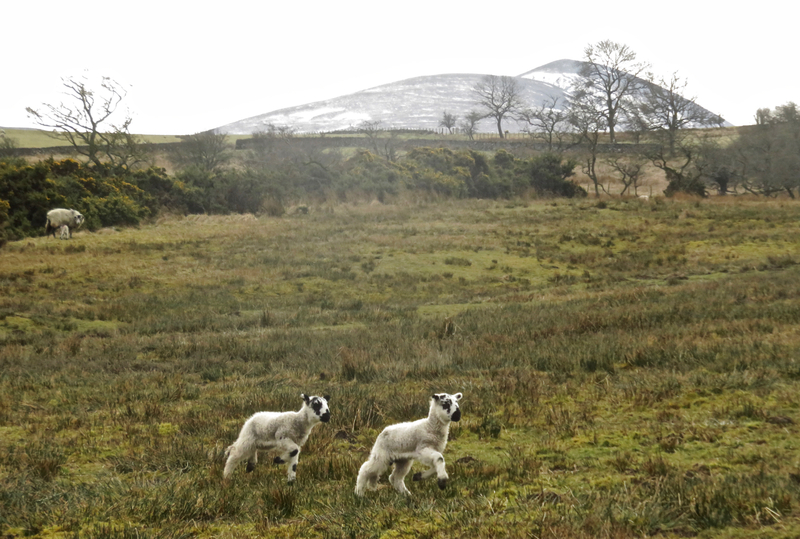 North of Longlands Fell is the rise of Lowthwaite Fell: gentle, but in fact higher than its neigbour. You don’t actually need to go over it though. It is possible to traverse to the left, then at the junction take the higher path right to head in the direction of Great Sca Fell, which as noted above could be added to the walk (but I have other plans for it). What I did, though, was then to turn right at the main col (more or less at the point depicted at the bottom of this page), which does not look much like a path at first but does resolve itself into one that heads down to the collection of little streams north of Meal Fell that constitute the headwaters of the River Ellen. 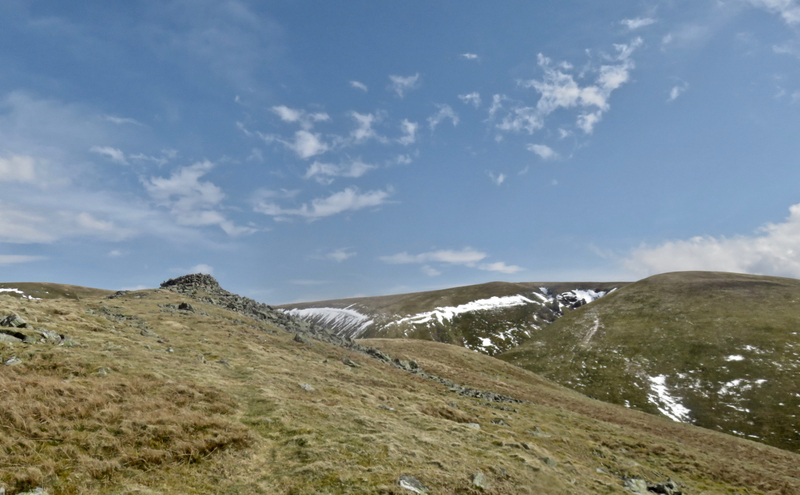 The path remains fairly clear and leads you up to the col below Meal Fell; there is a stiff but short climb up from the streams but once on the ridge it is easy up to Meal Fell’s interesting little summit. From there just follow the paths down to Trusmadoor (a neat little pass though it does not really live up to the eulogies Wainwright bestows on it), then straight over and up the slope to Great Cockup. Keep following the ridge-path until there is an obvious track descending to the left, which is marked on the map on page Great Cockup 4 as ‘route recommended but no path’, but a path it certainly is. Take it then at the bottom, turn right along the bridleway and just follow it until it descends down to the road at Horsemoor Hills. Turn sharp left and then it’s about two miles on tarmac to Bassenthwaite. Windy commentary: One of the things about doing all these a second time is that I know what’s coming. Which can be a very pleasurable thing when it comes to certain parts of the District but a barrier to revisiting when it comes to others. 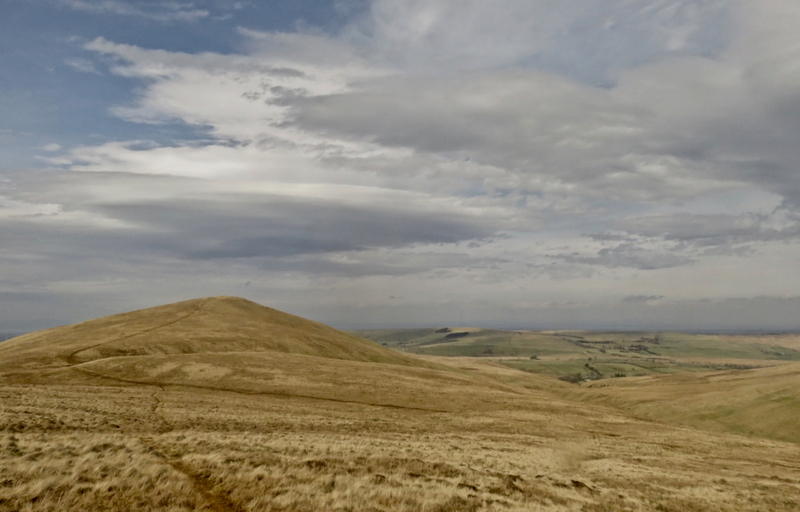 The prospect of hauling myself up Lank Rigg again, for example, is not a particularly appealing one — and on top of that I know what a haul it is round to West Cumbria in the first place. I am certainly holding out for a bright sunny day for that one. But I can’t keep nibbling off the best and most convenient walks and leave all the lesser ones until the end. Today’s walk was not one I have been avoiding, as such, but I did have to convince myself to go for it when in the end a less logistically complex one (on transport and on foot) would have been my preference. 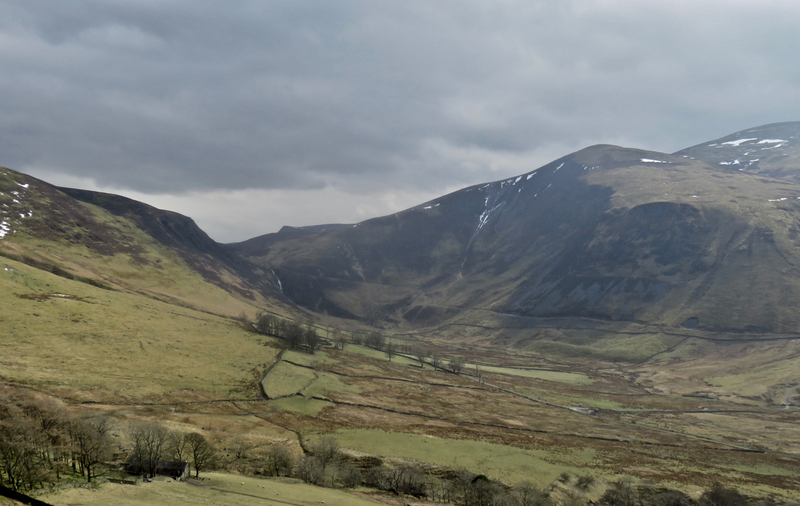 The Uldale fells are smooth and rounded, with rocks at a premium though they are scoured by numerous deep ravines. So not prime walking territory and not, I know, the jaunt into the Western fells that I promised. But they needed doing. 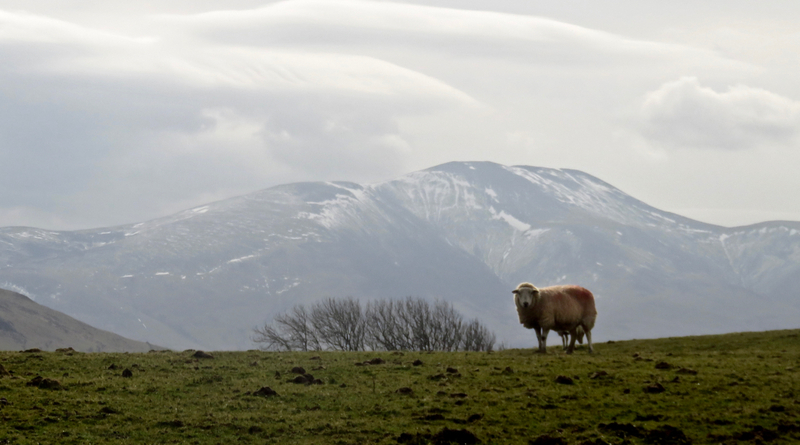 There’s that ‘sheep and Skiddaw’ theme again. You get a lot of both on this walk. In the end this was a decent walk but the wind did become tiresome, there were only a few blissful passages of shelter: in High Ireby, nestled in its surround of trees, in that little dell below Meal Fell that is the headwaters of the Ellen, and on the final walk through the woods to Bassenthwaite (though it was raining by then). 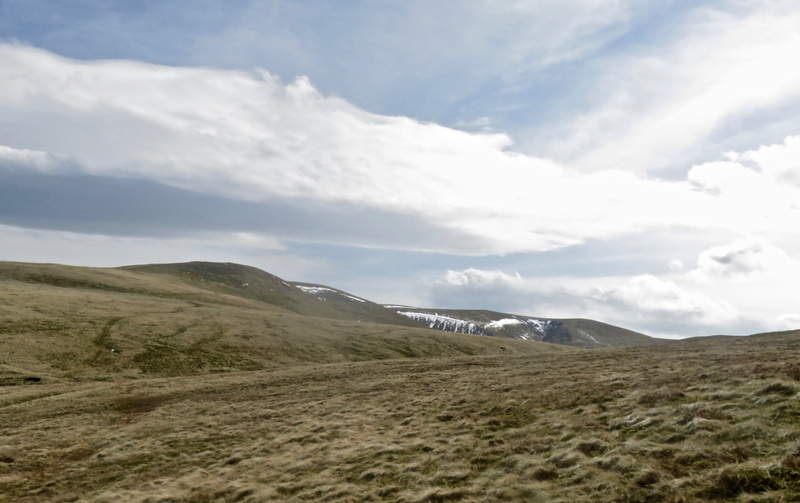 On Longlands Fell I had to climb it and face the summit with the gale full in my face. The only other walker I met today, whose arrival at the shelter on Meal Fell’s summit coincided with mine, told me he had not been able to complete the ridge walk along Great Cockup at all due to the wind. Seeing as that was the direction I was heading in this was somewhat worrying, but either he was exaggerating or he’s just not as windblown as I am, but I did walk it in the opposite direction to him and found that a little easier than Longlands so maybe it was just a matter of whether one was facing the gale or not. Certainly one of the windiest walks I’ve done though. But at least it was done, I was beginning to think that the whole Easter break would pass without a chance. I’m still only making one walk a month however. Let them just continue to come as they will, though. I can ask for no more.